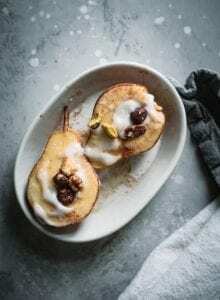 These healthy baked pears can be a sweet and simple snack or a fancy, decadent dessert. Serve them on their own or try them topped with coconut yogurt, nuts and granola. Slice the pears in half and gently scoop out the seeds. Drizzle each pear with maple syrup and sprinkle with cinnamon. Bake on a baking pan or in an oven-proof dish until soft and tender, about 25-30 minutes. Top with your choice of coconut yogurt, coconut butter, almond butter, granola or nuts.